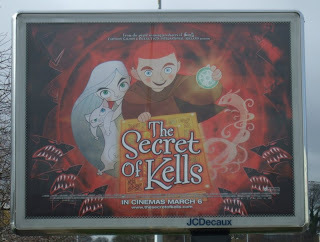 The Blog of Kells: We need YOU! The Posters are up. The ads are on telly. The trailers are in cinemas and the press has been great here in Ireland just like in France and Belgium with some lovely reviews and general goodwill. Trish Long, Ruth Bradley ,Richard Coralan and all the team in Disney Ireland have been doing a fantastic job on the marketing. Brendan Gleeson , one of our finest actors has really shown us so much support and gotten behind it. So , now its up to YOU guys! Please come out this weekend and attend the film, I hope you will enjoy it , and if you do , please tell everyone you know about it! She was really looking forward to see this film after seeing the trailer on youtube. The film was no disappointment. We had a great time and are looking forward to a dvd-release. I really hope Brendan will be playing to larger crowds in the UK, Ireland and the USA. I went to watch it again on Sunday, and there were many people, but they only show it in Lille on a small theater and only in the mornings!! I have to say the French version is pretty good thou! Best of luck Tomm! The people of Ireland are in for one heck of a treat when it is released this week. Arrrgh! I wanna! I wanna see it so bad. But I can't afford a euro trip right now. I hope you guys are able to send it to Canada. I promise I'll get as many of my friends to see it as I possibly can. Last saturday we went with our daughter to see the dutch version. Our daughter (Iona - yes that's her name , 3 years old) enjoyed every bit of it. Even the scary parts. My husband and I liked it very much, in fact it was one of the best animations I've seen..and I'm a Disney-fan! :-). We're hoping to visit Ireland again soon (it would be our 4th time). And we're very happy we called our daughter Iona (made in Ireland you know :-)). We'll speak as much as possibele about the film. Hopefully it will get more attention. I can't wait to see the film it looks amazine. I love the website aswell its great. I am using the education worksheets for primary schools next week for College4Kids at Tipperary Institute. Thanks. Best of luck with the film. I know it will be huge. I saw the film some two weeks ago, here in Rennes, dubbed in French, with some friends all studying Breton language&culture. 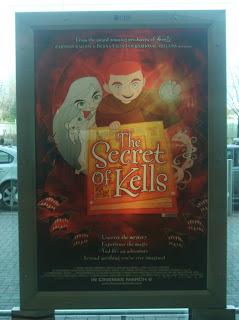 My friends as well as myself loved it, with the pretty artwork and all the references to Old Irish culture! and Pangur Ban is too sweet! Thanks for creating this lovely movie. Will it come on dvd as well?